The inherent properties of wood include strength, durability, sustainability, and flexible design options, which allow architects to design commercial and nonresidential buildings to a higher level of thermal performance. 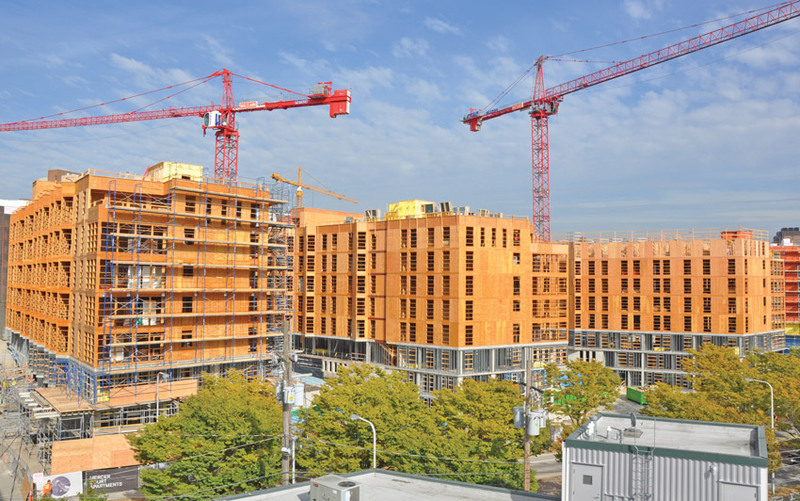 Compared to other building materials, choosing wood framing, both light frame and mass timber, leverages the natural attributes of wood and provides for accessible code compliance and energy savings. Whether choosing light frame design or leveraging the advantages of mass timber products, wood continues to provide economic, structural, and environmentally efficient benefits to designer, builders, and occupants. Wood is a strategy used to denote building entries and as a transition between exterior materials. 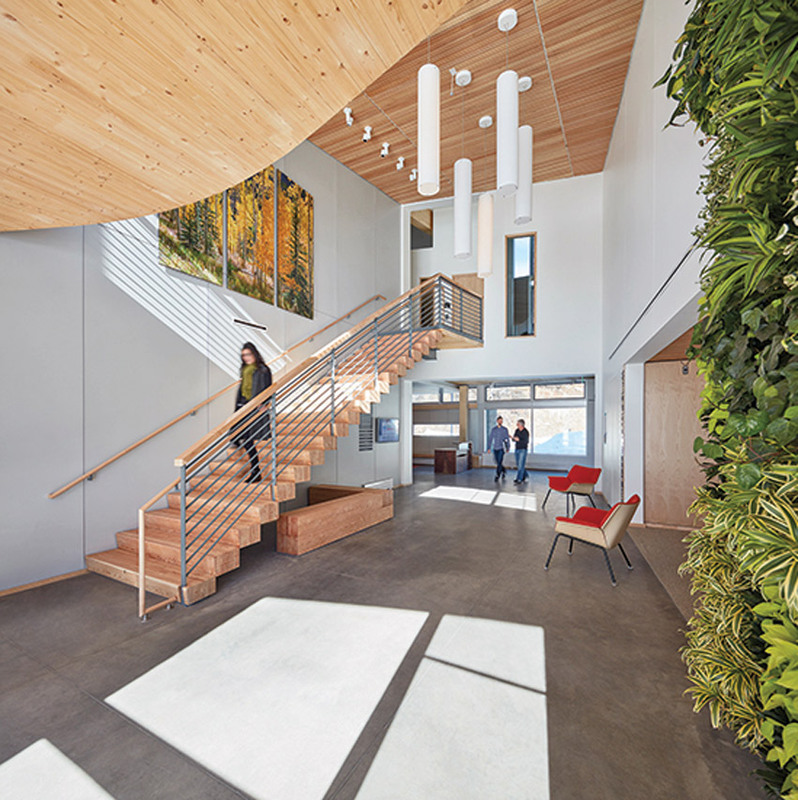 Curved CLT, wood slat ceilings, and a living green wall contribute to biophilic design goals by creating a connection to nature. 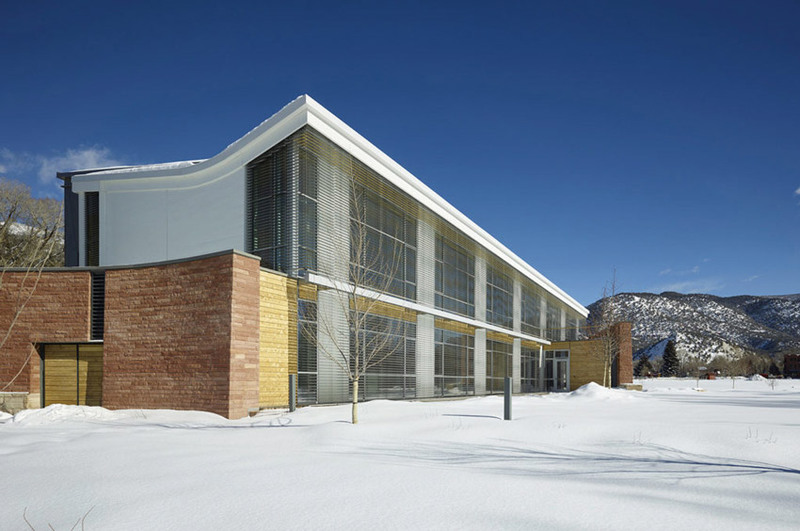 High in the mountains near Basalt, Colorado, at an elevation of 6,611 feet, the Rocky Mountain Institute (RMI) stands as an example of how design and material selection can be married to create a highly functional, energy-efficient, and thermally comfortable building. RMI was designed to meet the criteria of a net-zero facility using a maximum annual energy consumption of 19 kBtu per square foot. As a requirement, the project had to be completed with materials commercially available on the market, using the principles of a lean and integrated design to achieve a high-performance and biophilic facility. The two-story, 15,600-square-foot, net-zero-energy building integrates sustainable thinking with responsive design to provide office and collaboration space for RMI research as well as the White Steyer Impact Studio for convening seminars and conferences. A beautiful structure focused on community outreach and occupant experience. Prefabricated wood components enabled an efficient schedule in the snowy climate’s short construction window, and the use of a wood structure supported RMI’s desire to reduce carbon impacts, not only in the operation of the building (it is net positive) but also in its construction. Cross-laminated timber (CLT) was used for the second-floor deck, which decreased floor assembly thickness by 14 inches and allowed reduced floor-to-floor height, resulting in a reduction of overall project volume and envelope area. This added headroom also allowed for increased ceiling heights, reduced thermal losses, improved natural ventilation, and increased daylight penetration. By using both 9-ply and 3-ply CLT, designers were able to meet structural requirements while also creating a mechanical cavity for building systems. Glulam was selected for stairs, columns, and roof beams. “When harvested using the most rigorous and comprehensive sustainable forestry practices, wood can be a sustainable and beautiful structural option to achieve energy efficiency, thermal comfort, and durability,” says Chris Chatto, principal, ZGF. Wood provided the ability to achieve the curves and bends of the original design intent. Additionally, local contractors were very familiar with wood, which enabled a faster construction schedule and better bid response. Composite mass timber elements, structural insulated panels, and quad-pane glazing helped create the efficient, low-carbon, 100-year structure intended to be a living laboratory and demonstration facility for RMI. In the project’s first year, it was certified as Passive House Institute (PHIUS) 2015+ and LEED Platinum and operated net positive, all while meeting the Architecture 2030 goal of a 70 percent energy reduction based on efficiency alone (before accounting for on-site energy generation). Located adjacent to the Ninth Street Commercial District and Duke University in Durham, North Carolina, this large mixed-use development by Crescent Communities includes 10 four-story wood-frame buildings, with a total of 270,656 square feet and 303 residential units over 6 acres. Designed to achieve LEED certification, the development includes (among other features) high-efficiency heat pumps, motion sensors that reduce lighting energy consumption within amenity spaces, and ventilation ducts that provide outside air directly to the heat pump unit return ducts. Within these units, external air dampers monitor outside conditions and limit the amount of humid air introduced to living spaces. The development meets the requirements of the 2009 North Carolina Building Code and follows the performance path of ASHRAE 90.1-2004. It includes 2-by-4 wood studs at 16 inches on center (o.c.). All interior walls between living units and all exterior walls are insulated with fiberglass batt insulation within the stud cavities. The development features different air barriers based on a variety of cladding materials. Stucco was placed over a layer of building wrap and a layer of building felt; siding or paneling was placed over a layer of building wrap. For areas with stone and brick, veneer was installed over continuous self-adhering membrane flashing, which was installed over primed wood sheathing. A combination of felt and paper backed with metal lath was also installed over the membrane flashing depending on the application. 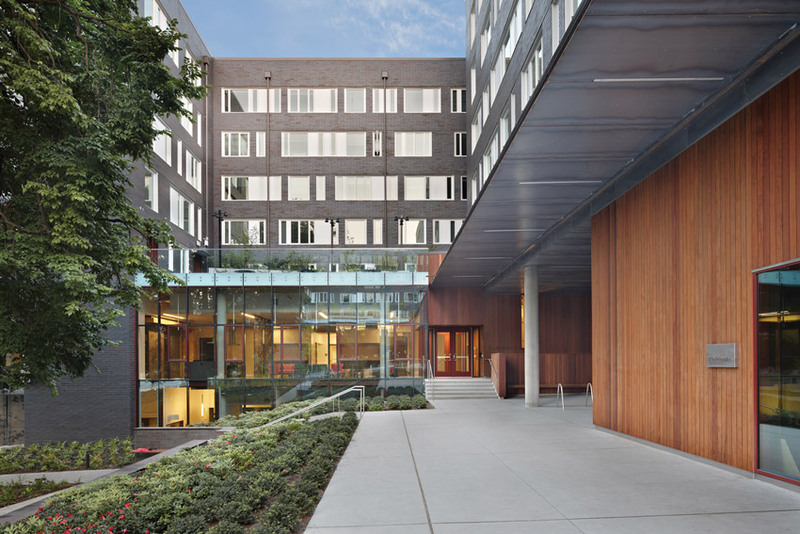 The Washington State Building Code and City of Seattle Building Code recently added whole-building air-leakage requirements for large buildings, including wood-frame multiunit residential buildings. Within both of these codes, a maximum air-leakage rate of 0.40 cfm/ft2 at 75 pa must be met. This target is regularly being met within large multistory wood-frame buildings where good air-barrier design and construction is being implemented. Several of these buildings achieved whole building airtightness values below 0.20 cfm/ft2 at 75 pa following different air-barrier strategies. 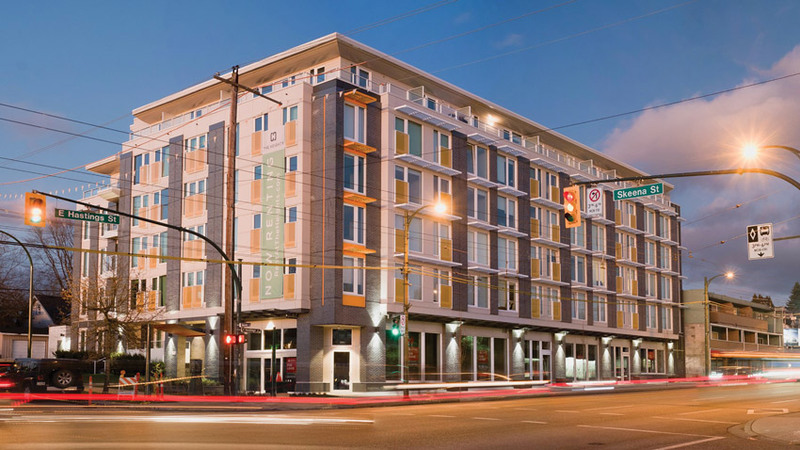 The Heights is a six-story mixed-use building with a ground-level commercial space and a single level of underground parking constructed in concrete, along with 85 apartments occupying the rear of the ground floor and the five stories of wood-frame construction above. At the time of construction, The Heights garnered the designation as Canada’s largest building designed to the Passive House (PH) standard. At commissioning stage, the airtightness test showed only 0.3 air changes per hour, half the air infiltration rate permitted by the PH standard, and the HRV balancing has been at or better than the design criteria. Passive House buildings consume 80–90 percent less energy for heating and cooling than conventional buildings and require a significantly higher standard of technical design and construction quality control. As part of the energy-efficient design, The Heights deleted conventional industrial boilers and replaced traditional concrete floors with wood. Wood-frame construction proved to be an instrumental part of the successful design process for achieving Passive House standard buildings. Wood itself has reasonable insulation value and facilitates detailing to minimize thermal bridging. Mass timber wood products capitalize on the strongest characteristics of wood and employ a factory-controlled production setting to create products that provide exceptional structural and thermal qualities. Mass timber construction is efficient, and quality and speed correlates to revenue, whether the project is an office, school, student residence, condominium, or hotel. Mass timber structures are lighter than both the steel equivalent and post-tensioned concrete, so projects may benefit from a smaller foundation requirements and lower seismic loads. 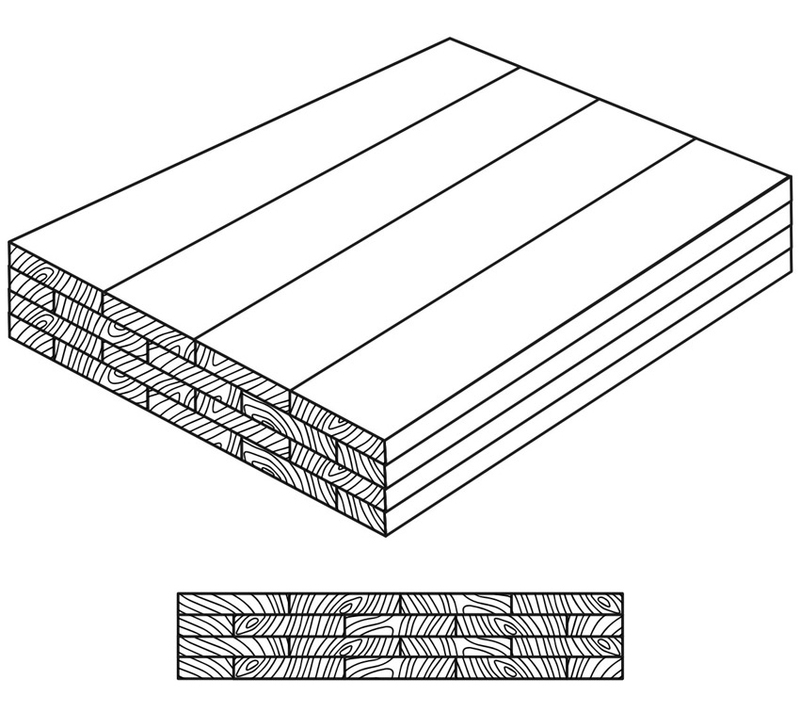 There are four main types of mass timber products: cross-laminated timber (CLT), nail-laminated timber (NLT), glue-laminated timber (glulam), and dowel-laminated timber (DLT). CLT is constructed of a number of layers of lumber, glued together with the grain of alternate layers laid at right angles to one another, much like the veneers of plywood. The 2015 International Building Code (IBC) and 2015 International Residential Code recognize products manufactured according to the ANSI/APA PRG-320: Standard for Performance Rated Cross-Laminated Timber. Under the 2015 IBC, CLT at the required size is specifically stated for prescribed use in type IV buildings. However, CLT can be used in all types of combustible construction—basically wherever combustible framing or heavy timber materials are allowed. The National Design Specification (NDS) for Wood Construction is referenced throughout the IBC as the standard for structural wood design, including CLT. The 2012 code does not explicitly recognize CLT, but the 2015 code provisions for CLT can be a basis for its use under alternative method provisions. 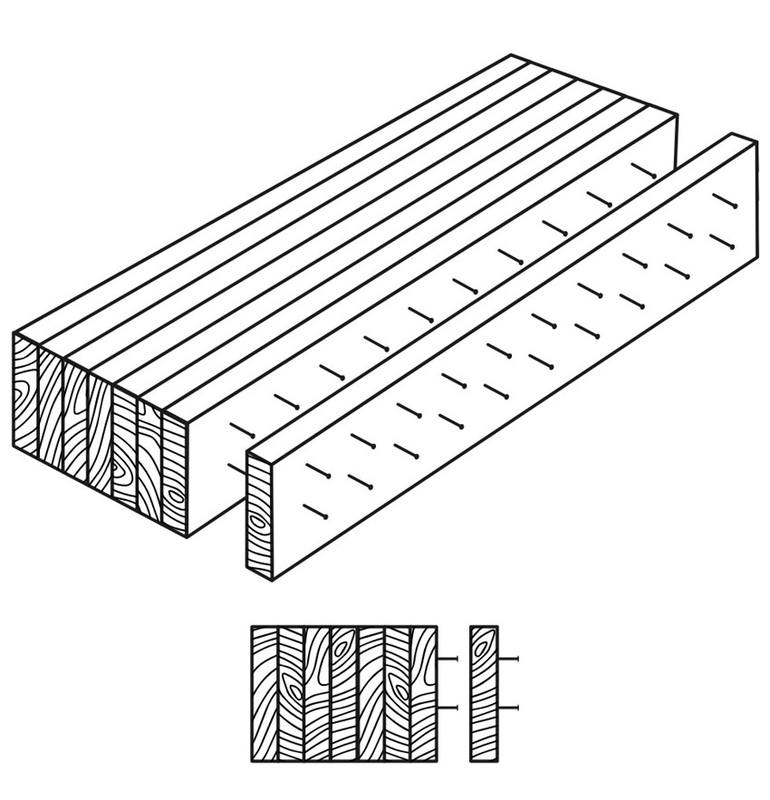 NLT, or nail-lam, is created from individual dimension lumber members (2-by-4, 2-by-6, 2-by-8, etc. 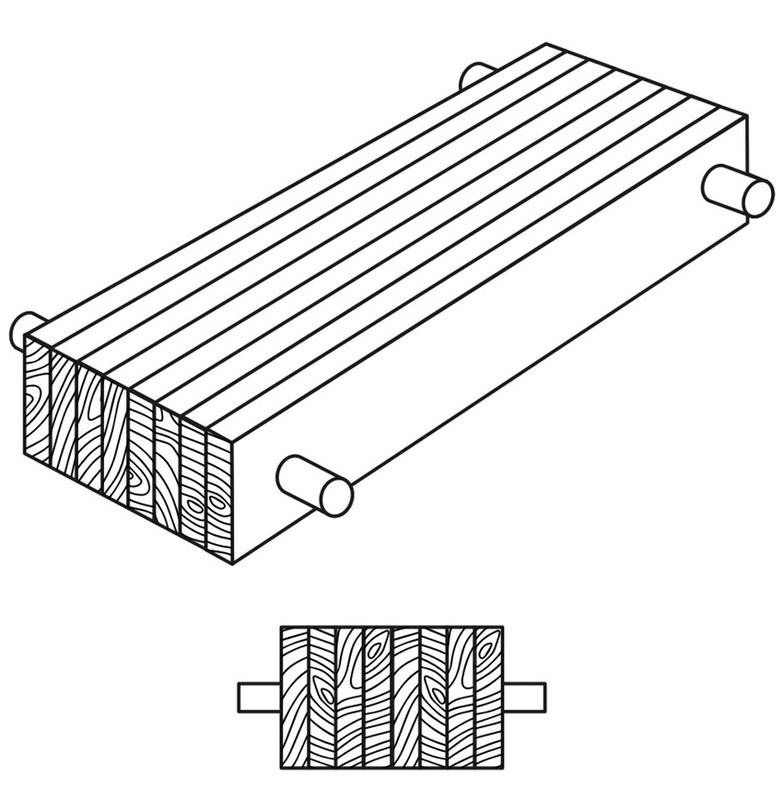 ), stacked on edge, and fastened with nails or screws to create a larger structural element. NLT is far from new—it’s been used for more than a century—but it’s undergoing a resurgence as part of the modern mass timber movement. Commonly used in floors, decks, and roofs, it offers the potential for a variety of textured appearances in exposed applications, and wood structural panels can be added to provide a structural diaphragm. NLT also has been used to create elevator and stair shafts in midrise wood-frame buildings. NLT naturally lends itself to the creation of unique roof forms. Panels are comprised of individual boards spanning in a single direction, so both singly curved and freeform panels can be created by slightly offsetting and rotating each board relative to the others. This allows the complex geometry of curved roof and canopy structures to be realized with a simple system. No product-specific ANSI standard is required, as the structural design of each element is covered by the National Design Specification and applicable grading rules. NLT can be used in all types of combustible construction. Glulam is composed of individual wood laminations (dimension lumber), selected and positioned based on their performance characteristics, and then bonded together with durable, moisture-resistant adhesives. 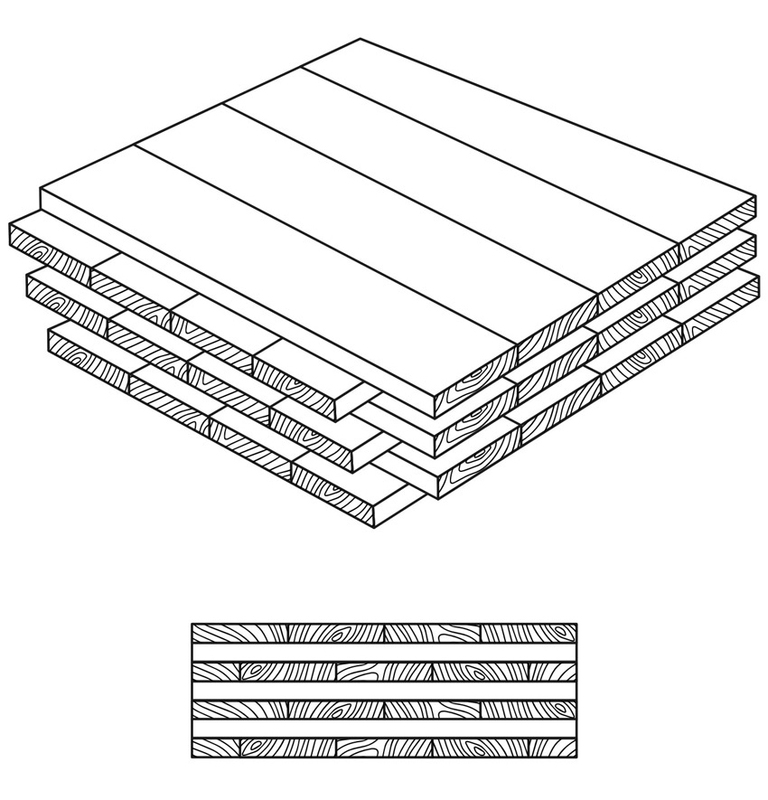 The grain of all laminations runs parallel with the length of the member. Glulam has excellent strength and stiffness properties and is available in a range of appearance grades for structural or architectural applications. While typically used for beams and columns, designers can use glulam in the plank orientation for floor or roof decking. With careful specification and design that considers the flatwise structural properties, deep glulam sections can be placed flatwise as decking similar to NLT. With the flexibility of glulam manufacturing, glulam “panels” can be used to create complex curvature and unique geometry. When used in such innovative floor and roof panel configurations, glulam is seen as an extension of the mass timber product family and sometimes referred to as GLT. The IBC recognizes glulam products manufactured in conformance with ANSI Standard A190.1-2012: Standard for Wood Products—Structural Glued Laminated Timber. DLT panels are an all-wood product, made from softwood lumber stacked like NLT, then friction-fit together with dowels. The friction fit lends some dimensional stability to the panel. DLT panels may be processed using computer numerical control (CNC) machinery, creating a high-tolerance panel that also can contain preintegrated electrical conduits and other service runs. DLT panels are a next-generation mass timber product that is particularly efficient for horizontal spans and allows for architectural flexibility. Commonly used in Europe, it is the only all-wood mass timber product and does not use glue or nails. The structural design is covered by both the NBCC and IBC and applicable grading rules. Panels are made from softwood lumber and are stacked like the lumber of NLT, then friction-fit together with dowels. Dowels hold each board side by side, similar to how nails work in an NLT panel. Among the advantages of DLT, acoustic strips can be integrated directly into the bottom surface of a panel. This can help a designer achieve acoustic objectives while keeping the wood exposed and allowing for a wide variety of surface finishes. 1Graham, Finch et al. Guide for Designing Energy-Efficient Building Enclosures for Wood-Frame Multi-Unit Residential Buildings in Marine to Cold Climates in North America. FPInnovations and RDH Building Engineering Ltd. 2013. Web. 19 April 2018. 2Upton, Brad et. al. “The Greenhouse gas and energy impacts of using wood instead of alternatives in residential construction in the United States.” Biomass & Bioenergy. Elsevier. 2008. Web. 19 April 2018.